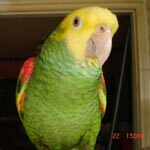 Parrot Forum • View topic - Is it love??? Awwww, thank you for coming back and posting this! And, isn't it amazing how tuned to us they are?! They know what a human laugh and a kiss means - they know what we consider funny or sad... I love all animals but parrots are on a completely different level, aren't they?! There is no fear or stress. The sound level was not good so I am guessing that the bird was laughing on it's own and not instigated by you. The personality is set and yes I believe it is love. Many people who should know better have told me that I claim human emotions for my critters. They even come to the point to say I am crazy. I feel sorry for them and for the critter that they are not bothering to see. Watching my birds has made me look even closer to my furry critters. I have always claimed that they had emotions but the extent is farther than I gave them credit for. I just thought mine were unusual. (My Calicat had compassion. She stuck to me like glue when I was sick or when I was injured to the point of being a nusance.) I have been seeing it in other animals. Some even rescue a critter of another species that would normally be it's prey. All animals and even reptiles have the same emotions that we do. The difference in that is when we don't look for it. They love faster than humans and bond tighter.